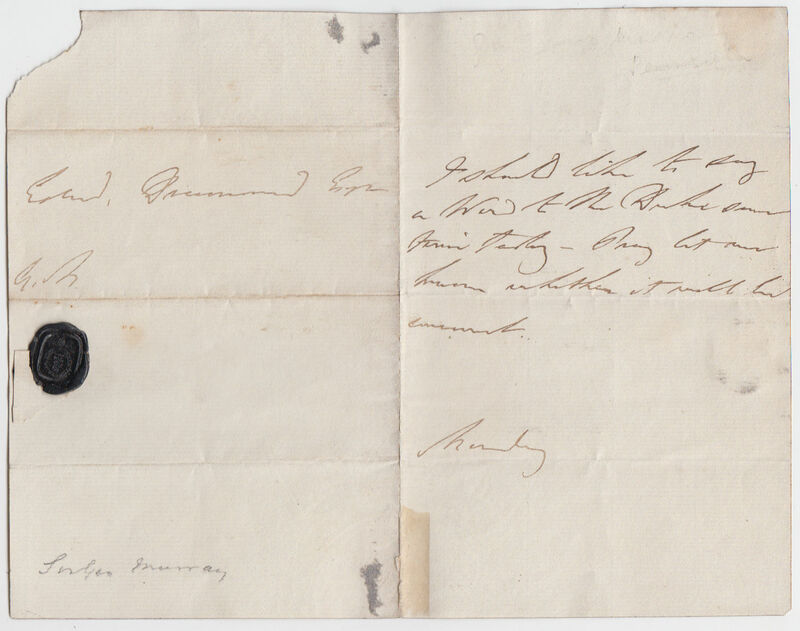 Autograph Note, unsigned, to Edward Drummond: “I should like to say a Word to the Duke some time today – Pray let me know whether it will be convenient.” 1 page 7 x 4½ inches, with the address leaf, signed ‘GM’. Black wax armorial seal. Undated. General Sir George Murray (1772-1846) was Wellington’s quartermaster-general in the Peninsula. He joined the army in Flanders after Waterloo, and remained with the army of occupation for three years as chief of staff. Edward Drummond (1792-1843) was Private Secretary to a succession of British Prime Ministers: George Canning, Lord Goderich, the 1st Duke of Wellington, and Robert Peel. On 20 January 1843, while serving as Personal Secretary to Peel, he was shot by Daniel M’Naghten (or McNaughton), who had developed delusions about the Tory government.